Spring into the spirit of Easter this year by transforming your home with all the extraordinary decorations of the holiday! That includes all of the traditional symbols of Easter including pastel tulips and lilies, bunnies, chicks and decorated eggs. All you need is a few great ideas, creativity and little family team work. A great start to your Easter holiday is to utilize household items for decor in the home and for the garden or front porch. You can always start with a fun craft project such as creating an Easter wreath using one that you already have and updating it with items that symbolize the holiday. Give your wreath a face lift by hot gluing artificial eggs or tiny critters like chicks and rabbits around it. Add a pastel ribbon and you have an Easter wreath! Another simple trick for creating an Easter ambiance around the home or in the yard is to hang colorfully decorated artificial eggs from a tree or in front of a window. Try using wooden eggs or plastic ones that are easy to glue or nail to a ribbon or strand of twine. Then, hang them from a tree in your yard, a plant on your porch or in your front window and let the Easter sun shine in! 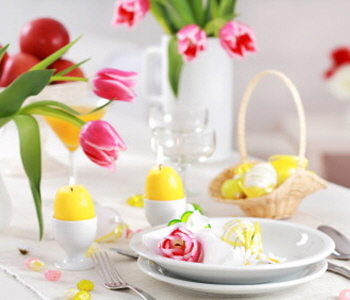 It's easy to create beautiful Easter decor for the table as well with a few simple items and arts and crafts. Lilies and Tulips make for great centerpieces when paired with whimsically decorated eggs, rabbits and baskets. In fact, a pretty basket is a great place to start when creating a centerpiece for your Easter table. If you don't have any baskets handy from around the house, they can be purchased at a craft store or supermarket. Once you've chosen the ideal Easter basket, you can fill it with decorative grass, shredded paper or tissue paper and then add decorated eggs, porcelain rabbits, or artificial flowers. Or if you prefer a more natural look, you can decorate the basket by sticking dried flowers in-between the weaving and fill it with a fresh or dried bouquet of Spring flowers. You can also decorate candles by surrounding them with home-made nests filled with eggs or smaller baskets filled with candy. Use your imagination!